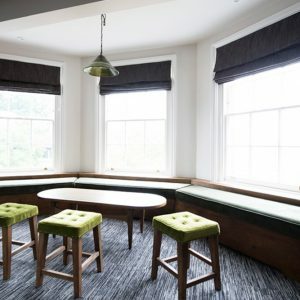 We have a passion for designing those in-between spaces, so often forgotten about such as a staff breakout rooms, which are essential to the smooth running of any organisation. We were thrilled to have the pleasure of working with King’s College School Wimbledon, winners of Sunday Times Independent Secondary School of the Year 2014. 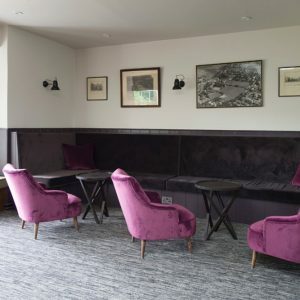 The Bursar, David Armitage, and the school leadership team understood how important the working environment is for their staff and asked us to update the interior of the Senior School Common Room to make the staff feel valued and to attract and retain the best talent. 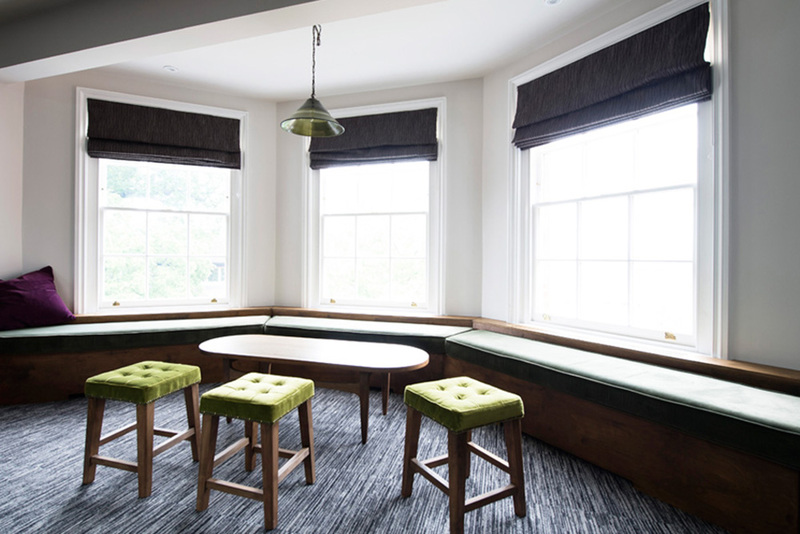 The homely feel throughout the new interior design reflects the South Hayes House history. The building was previously a large private house built in the middle of the 18th century. 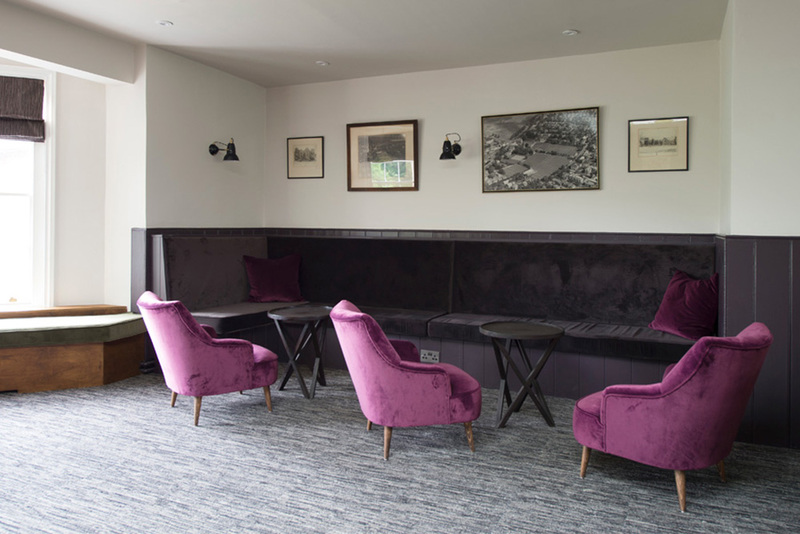 We sympathetically enhanced existing period features and used notable colours of the past and mixed these with a soft palette of natural textures, woods and accents of forest shades creating a calm and quiet space that reflects Wimbledon Common where the school is located. This is a calm away from the hubbub of school life. 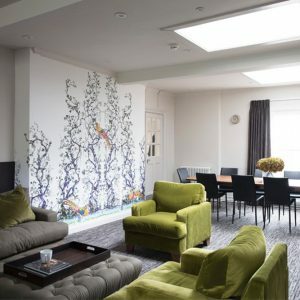 We teamed carefully thought out details, textiles and colours with select domestic styled furniture to give a home from home environment to support a creative and innovative workforce. 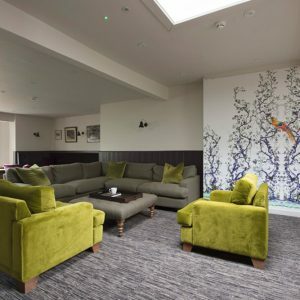 We worked with Sofa.com to select residential style seating which was upholstered with commercial grade fabrics as traditional office furniture was not right for the design aesthetic of this interior. 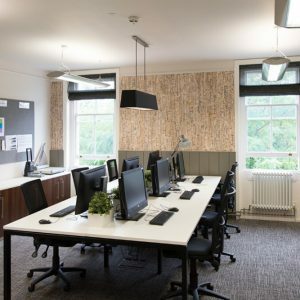 A flexible layout was created to encourage relaxed working styles for individuals or groups, with quiet spaces for reading and resting. A large kitchen table is at the heart of the lounge allowing for broadsheet newspaper reading over breakfast and sharing of ideas. 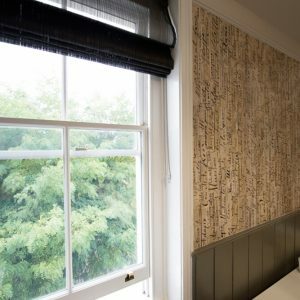 Bold rural hand drawn wallpaper “A birds in bush” from Timorous Beasties and Tektura creates a stunning backdrop to the interior with all colours of the soft furnishings being pulled out from the drawing to bring the space alive, along with carefully selected home accessories. The large space was updated with new lighting and a stunning grouping of glass coloured pendants from Pooky, hung at random heights within the roof light and in the bay window. Bespoke built-in seating was designed to make the most of the bay and alcove areas, upholstered in soft velvets with woodwork in either stained plywood or painted to match the deep berry velvets to give a seamless look. 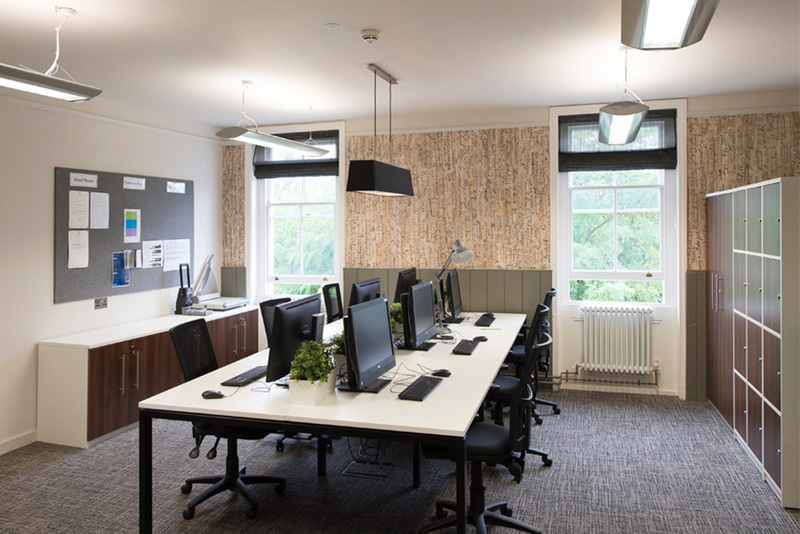 The new open plan layout allows plenty of space for personal working styles, increasing staff productivity and creativity. There are no fixed working spaces giving staff freedom to choose how and where to work. The design is adapted to allow for the use of various personal computing devices. The large central workbench and tall side bench encourages a new way of working as the layout enables, and encourages, collaboration. 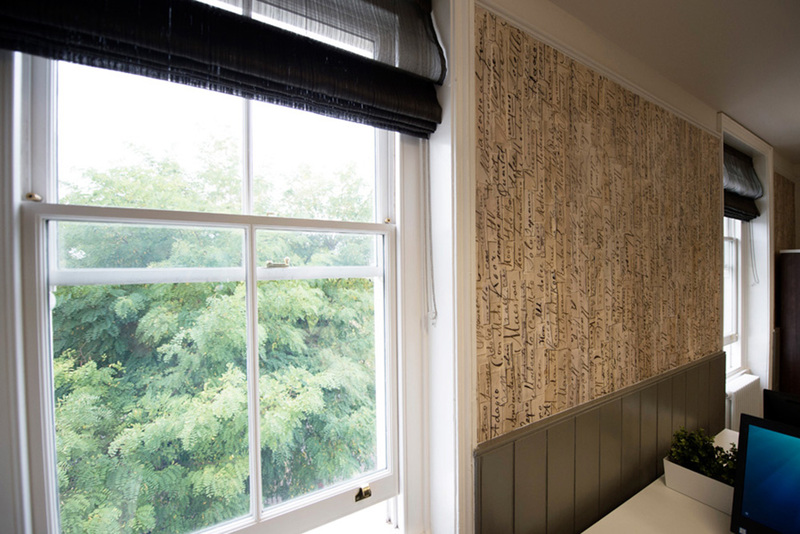 We framed the window wall looking out onto Wimbledon Common with a stunning wallpaper created from scraps of handwritten manuscript that was found and turned into wallpaper. We love the juxtaposition of the handwriting with the workplace technology in study. 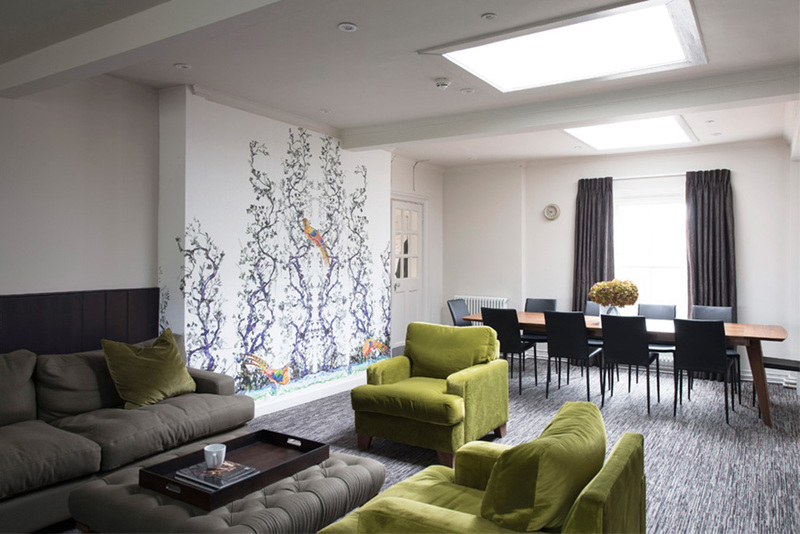 The Kitchen layout was transformed by repositioning the entrance from the study area which created a better flow in the space whilst allowing for more storage. We approached the space as an airport lounge, where customers want to easily serve themselves to quickly continue their journey. A mix of open shelving and plain white china made this process simple, allowing our clients to grab a cup and pour their hot drink at their leisure. We designed the Common Room interior down to the coffee bean with time taken to source the best bean to cup coffee machine supplier. The Rijo specialist machine offers freshly brewed organic coffee quickly and in a healthy way, allowing the staff to enjoy their break times and most importantly making them feel valued. This is a quintessentially British school so of course tea drinkers were not forgotten with a boiling hot water tap installed, making that cup of tea even easier and faster to make. 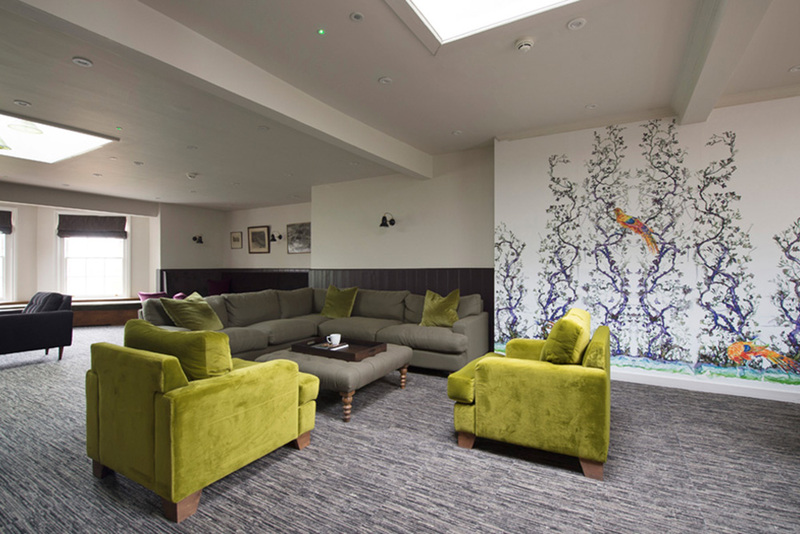 The common room, which was once a tired unused space, is now a hub of friendly activity which has transformed the way the staff connect and enjoy their working environment.